"The Heart of a Stranger"
I'm finding myself having a lot of fun with the offbeat miniseries of the late 80's-early 90's. It's interesting to revisit a time in which miniseries didn't just scream "cash grab". These are all well thought out, and... well, fun. We open in desolate blackness. A man is floating. Naked, save for a golden talisman hanging around his neck. In the distance he observes a glowing orb. Upon closer inspection, it appears to be a planet. The man heads towards it while pondering existence. Life and Death... do they apply to him? Can he live? Can he die? We are now in Gotham City. It is an awful rainy night. There has been a murder. GCPD Commissioner James Gordon is on the scene where earlier that night eleven "mob bigwigs" were all lined up and ran through with uzis. Gordon appears short-tempered, and makes mention of the past few weeks having been "particularly gory". Elsewhere, Dr. Bruce Gordon (no relation) is in his darkened office. There is a television featuring a news report of a horrific earthquake in then-Soviet Romania. He thinks to himself that the World appears to be falling apart, and questions his ability to keep something "locked up tight"... something he's felt coming to the surface... "happening again". He retires for the evening, while asking God when (or if) it will ever end. We are given a bit of insight as to the current state of the world. Volcanoes are erupting, all manner of natural disaster are striking. Delegates at the United Nations are resorting to fisticuffs, and war-like behavior and happenings are looming ever on the horizon... all while the Phantom Stranger looks on. In Metropolis, we join Jimmy Olsen who is hot on the trail of a clerk for the mobsters. This is following the arrest of a local mob ring. He comments that it is strange for this simple clerk to have made bail before the mob bosses. Jimmy proceeds to follow the clerk, and watches as he enters the Soviet Consulate. Back in Gotham, at the Temple of Divine Light, there is something of a sermon underway. The man preaching, Lycaon, sees the global events going on as divine retribution. He calls for all members of the congregation to open their hearts to the Lord, yet he be called upon to bring them the cleansing light. His seance is interrupted by the Phantom Stranger who attempts to reason with the members of the church. He sees through Lycaon's facade, calling him the "Chosen of Chaos". Lycaon summons a demon to deal with the Stranger, and a battle ensues. The Phantom Stranger finds that he cannot harm the demon when he attempts to bring forth his illumination. This is a rather talkative demon, who offers that the members of the church see not a beast, but a beautiful golden angel. He finds that the congregation would willingly give their lives for their perceived savior... allowing the demon to crush their bodies in his hands. The ruckus going on in the temple soon gets the attention of the GCPD, led by the still surly James Gordon. Gordon wastes no time getting into it with the demon. As the beast approaches, Gordon unloads his clip into it... killing it. The Stranger is shocked that a human succeeded where he could not. Before Gordon could interrogate the Stranger, he vanishes to ponder the meaning of this latest event. We watch Dr. Bruce Gordon getting good and sloshed at a local cocktail lounge before viewing a brief vignette featuring the Doom Patrol's Negative Woman, Valentina Vostok wherein she is discussing one called Maverick. It appears that he is in extreme danger, and it is ultimately decided to let him die. We are now in an almost medieval setting. There is a man shackled to a brick wall. In front of him is a turbaned man brandishing a scimitar-like blade. He is ordered to kill the man by a shadowy figure in the fore. He obliges, ending the prisoner's life. It is revealed that the man giving the orders is indeed Eclipso. The Phantom Stranger arrives on the scene, claiming that he used Eclipso's own evil as a beacon. Eclipso is nonplussed, having expected the Stranger to arrive sooner of later. The two exchange threats, culminating with Eclipso claiming that the Cosmos is nearing its end, and the Stranger is powerless to intervene. We make a brief stop at S.T.A.R. Labs where Dr. Jenet Klyburn is looking into the odd seemingly-natural activity currently going on worldwide. Finally, we close with Bruce Gordon being thrown out of the bar, and landing smack in the middle of a familiar silhouette. The Phantom Stranger knows there is a bond between Gordon and Eclipso, and claims that together, they can both vanquish the evil and end Bruce's suffering. This was a very intriguing way to start this miniseries. Before now I have had limited-at-best knowledge of the Phantom Stranger, having only really read his New-52 iteration. I thought it was okay, but nothing spectacular. This, however, was quite good. 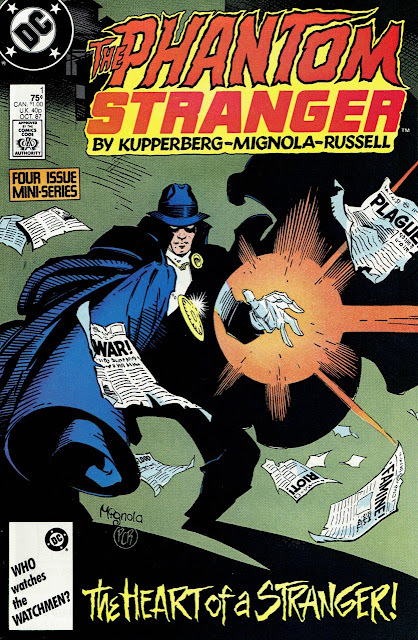 Phantom Stranger's mystique, at least to me, was that it was never revealed who or what he was. I thought that was amazing. It was the only thing I knew about the character, but it was interesting enough to put him on (admittedly peripheral) radar. It was neat seeing Commissioner Gordon dealing with a character outside of the Bat-family. When Batman and Company are involved, you almost get a feeling of comfort from Gordon. Here, with the Stranger? The Commish is noticeably ill at ease. I really liked that. Eclipso is another one of those characters that I am mostly-unfamiliar with. Like most folks my age, I followed the 1992 DC Annuals "Eclipso: The Darkness Within", but other than that... he's something of a novelty to me. His inclusion (along with Dr. Bruce Gordon) is welcome. I'm hopeful that when we continue with this miniseries more will be revealed. Paul Kupperberg's writing, is as it often is... really good. The dialog has a near-perfect blend of "street talk" and overblown fanatical rhetoric the likes of which one may see at a Brother Blood event... or out of one of Etrigan's contemporaries. The juxtaposed lingual tones are a tad jarring initially, however, I think that's kind of the point. The creature summoned, the fanatics, and the Phantom Stranger himself are out of place in Gotham City. Mr. Kupperberg appears to have a passion for this character, and it truly shows here. Mike Mignola's art, is as it often is... really good as well. The entire art team did a wonderful job of conveying the mood of this piece. It is dark... it is dank... Gotham at night is not a pleasant place to be. It is light horror, and it is beautifully done. If you come across this one, pick it up. Even if you have no interest in the character of the Phantom Stranger, this piece has a lot to offer. A great unique peek into Gotham City (and her people), and just a somewhat different and off center type of story. "Hmm, what should we make our new fun'n fruity candy look like?" "Err... Kids love dinosaurs... and guns... superheroes..."
"I got it! Chalk. Kids LOVE chalk!" "Yes, sir... (please kill me)"
This one has long been in the collection... unread. Ol' Slash may be prime for a visit.